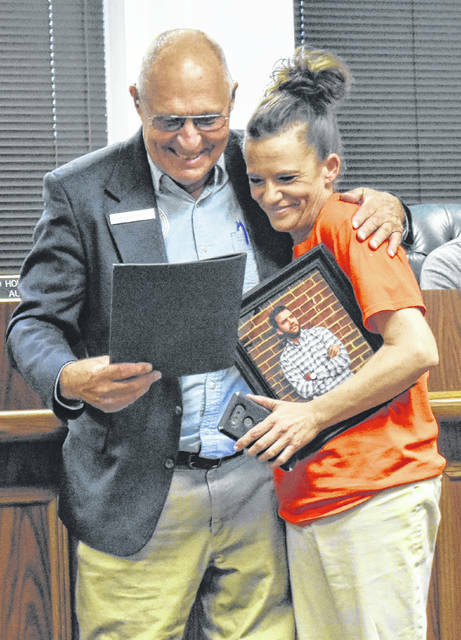 Shelby LaPine, right, accepts the Donate Life Month Proclamation from Mayor John Stanforth while holding a photo of her son Luke during Thursday’s Wilmington City Council meeting. Luke LaPine, who passed away in 2014, was an organ donor. WILMINGTON — A local solution may be the best solution to deal with the feral cat issue. Judiciary Committee chairperson Matt Purkey brought the issue to Wilmington City Council’s attention Thursday — after it was discussed at a special meeting on Monday — to see what would be the best way to handle it. “Our consensus at that point was that the trap/neuter/release method is how to handle the situation, but the city is not in the position to help fund that, per se. But we want to try and help spread the word about the two shelters we have … who do (spaying/neutering) on a regular basis,” said Purkey. Purkey also talked about how they looked at the possibility of creating an ordinance forbidding outdoor feeding of pets. He added that it would be an unenforceable ordinance that would rely on “neighbors ratting on neighbors.” He’s not saying he’s fully endorsing the idea, but he wanted to discuss it with the full council. Brittany Skidmore, who has volunteered at the Clinton County Humane Society for 11 years, spoke to council about why the feeding ban was a bad idea and why the neuter/release is a good idea. Skidmore told council she had personally helped “fix” over 109 cats in the area. She addressed concerns that it was a public health risk with info saying that it was nothing to be concerned about. With the outdoor feeding, she noted it could be an issue for those who are trapping them to get them spayed or neutered because outdoor feeding is the way they trap the cats. City Administrator Marian Miller pointed out to council that the Clinton County Humane Society had spayed or neutered over 3,000 cats and all of it had been done through donations, not through monetary grants. In regards to an official way of catching the cats for the programs, they noted there’s no “cat warden” or any position like that in the area. Both Swindler and Skidmore pointed out that when it comes to ferals and strays getting spayed/neutered and released, they usually remain in the care of those that catch them. Both also noted that caring for the cat after the procedure takes a lot of time and money before it’s released. While no official decision was made, Purkey was happy to have the discussion as they look what the best option would be. • Mayor John Stanforth made two proclamations. The first marked April 2019 as Autism Awareness Month in Wilmington. The second was to proclaim April 2019 as Donate Life in Wilmington, and he was joined by Shelby LaPine, whose son Luke was an organ donor. Shelby spoke about her son, who died in 2014 shortly after graduating from East Clinton High School, and how his choice to become an organ donor helped save numerous lives. Among those were a two-year-old burn victim and a doctor in New York City who received Luke’s lungs.